The Asteraceae is the second largest family of flowering plants (Division Magnoliophyta) with at least 1100 genera and over 20,000 species included. 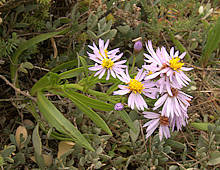 The type genus is Aster, typified by daisies and sunflowers with star-shaped flower-heads. 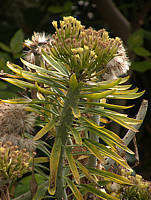 The Asteraceae includes shrubs and a few trees. Many Asteraceae are cultivated for their flowers. 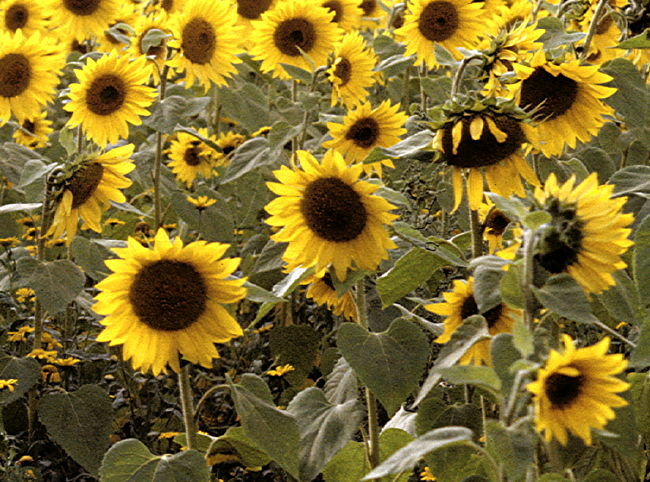 Sunflowers (upper right) are cultivated for their oil-rich seeds. Tussilago farfara (Coltsfoot) (lower right) is a traditional medicinal plant used as a cough suppressant. The natural insecticide Pyrethrum, made from the dried flowers of Chrysanthemum (Tanacetum) cinerariifolium and C. coccineum, has been in use in Persia since 400 BC and in Europe for over 200 years and was the basis of Keatings Powder. Pyrethrum and analogues are now made by organic synthesis. 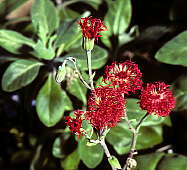 However only a small number of genera in the Asteraceae, including Kleinia, Notonia, Othonna, and Senecio, have succulent members. 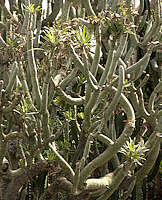 Most succulent species are leaf succulents although there are some stem succulents and caudiciforms. 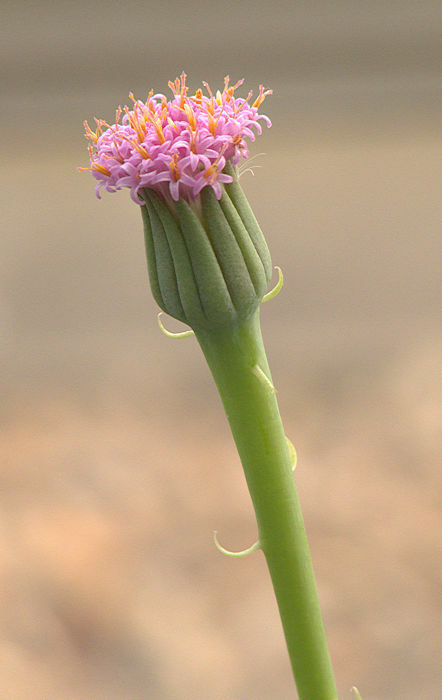 The inflorescence of all Asteraceae characteristically consists of tiny bisexual tube-like flowers tightly packed into heads known as a capitulum. Very often, a marginal ring of larger petals surrounds the flower head with each marginal floret (usually female) contributing a ray petal. Some species have discoid flowers without the marginal florets. 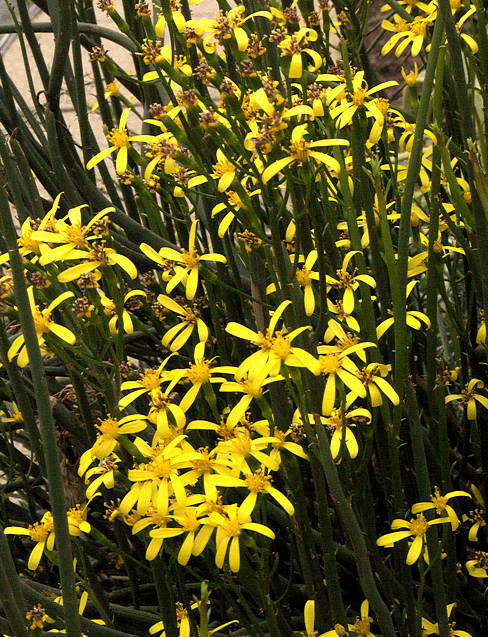 Cultivation: Many species of succulent Asteraceae are relatively undemanding in cultivation, although Othonna includes some tricky caudiciforms that should be watered sparingly. 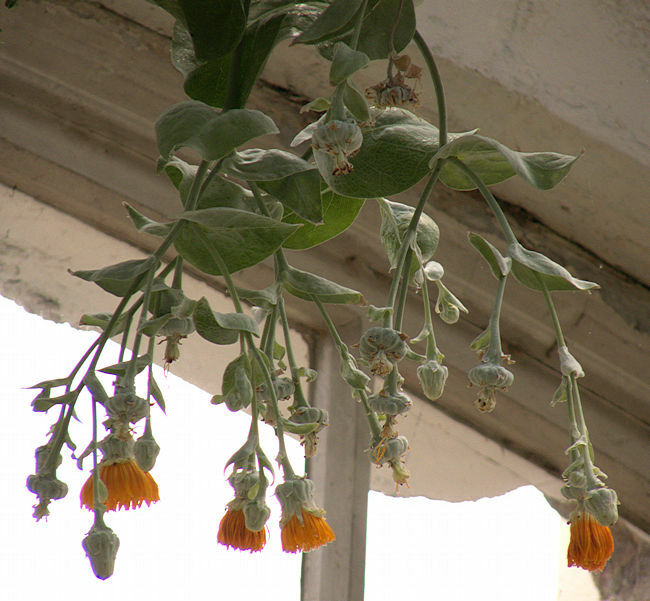 Trailing members of Senecio grow well in hanging pots from which the trailing stems hang down. Burkartia lanigera (Hook. & Arn.) Crisci Syn. Perezia lanigera Hook. & Arn. 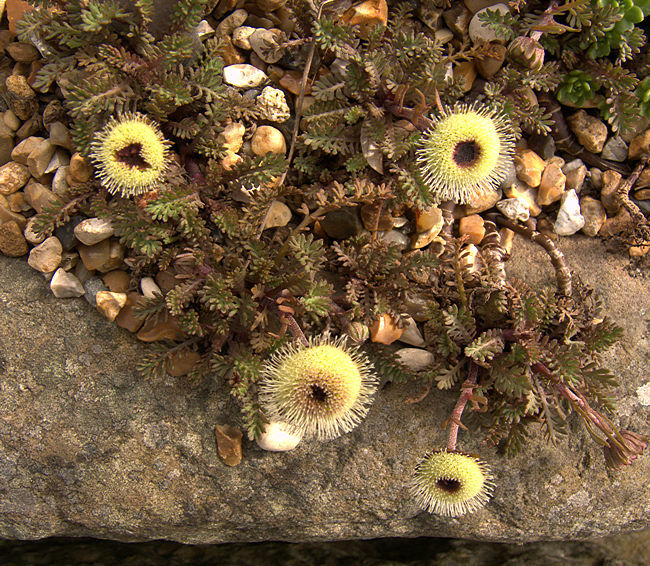 This mat-forming herb has small rosettes of tiny lanceolate succulent leaves with wooly leaf axils. Native to Southern Argentina. All 12 species in the genus Dendroseris are endemic to the Juan Fernandez Islands, about 400 miles West of Chile. The genus is very unusual in being woody, or semi-woody trees and shrubs, and interesting rather than truly succulent. All species in the genus are rare or endangered. a palmate pachycaul from the Juan Fernandex Islands West of Chile. 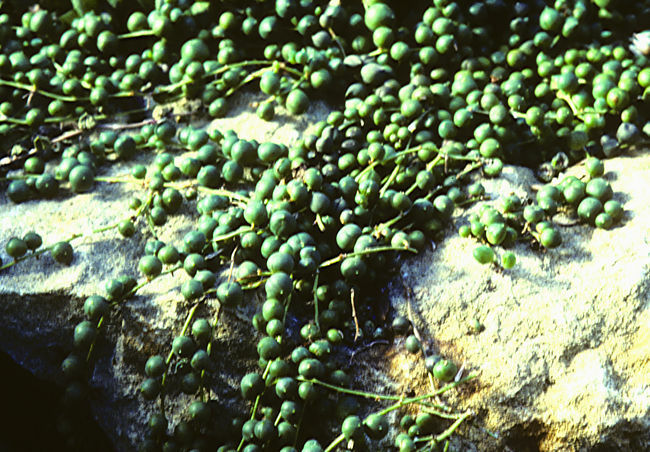 This species came close to extinction in the 1980s when only a handful of plants remained. 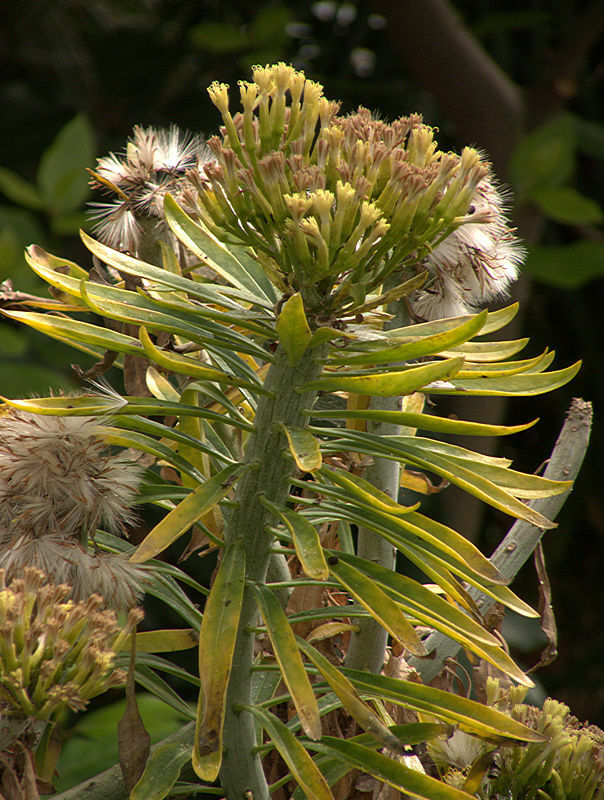 The large, rubbery leaves are edible and readily eaten by feral goats which contributed to the plant's demise. The leaves are said to have sustained the castaway Alexander Selkirk. The large orange flowers are hummingbird pollinated. Fortunately, the flowers are self compatible so seed is readily available and the species grows in several botanic gardens. 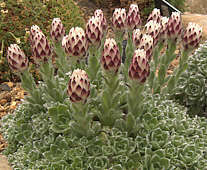 is a choice cushion-forming alpine growing at elevations of up to 8000 ft in the Drakensberg Mountains of South Africa. While this confers a degree of hardiness, plants should be protected from winter wet. The rosettes are markedly pubescent. The white to pinkish papery flowers are produced in Spring, persisting on the plant as shown extreme left. 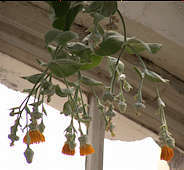 Several species of Helichrysum are grown for their "everlasting flowers" that when cut young and dried retain their shape and colour. 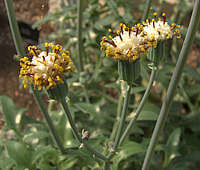 Helichrysum italicum Syn. 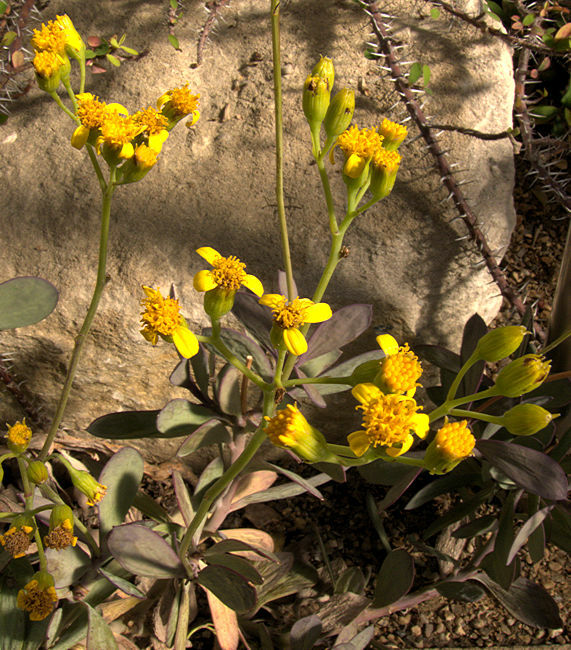 Helichrysum augustifolium is the source of an essential oil used as a fragrance. a vigorous, hardy perennial ground-cover plant from New Zealand where it grows in mobile scree. 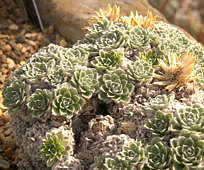 The slightly succulent dissected green leaves take on a bronze colour in full sun and set off the starry cream flowers. 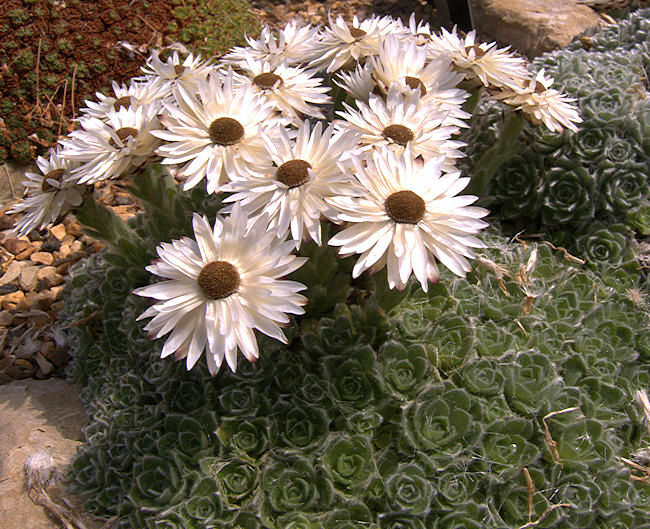 Grown hard it makes an impressive subject for an alpine garden but is liable to spread in more favourable conditions. 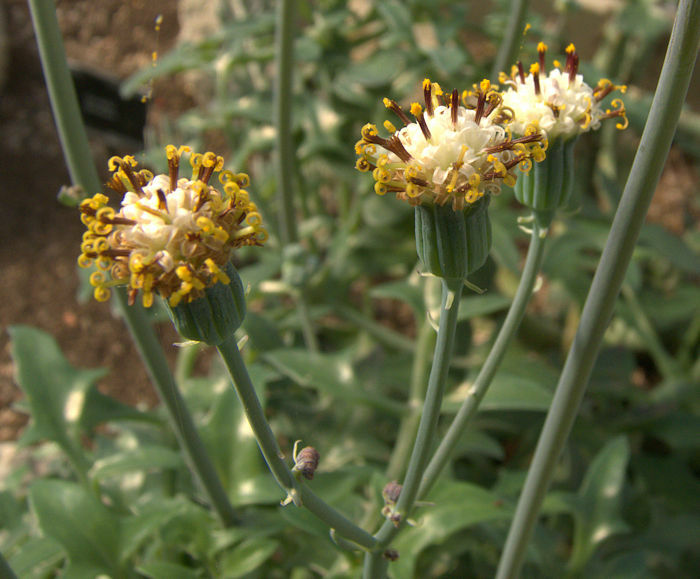 Golden Samphire is a perennial salt-tolerant succulent plant, growing up to 3ft tall. The stems bear narrow upwardly-curving fleshy leaves and in late Summer, a crown of bright yellow ray-flowers. The flowers are self fertile but also attractive to a range of pollinators including bees. Native to salt marshes and sea cliffs in Western and Southern Europe including Southern coasts of Great Britain and Ireland. The young leaves are considered edible, raw or cooked. Photos: Golden Samphire on limestone cliffs at Durlston, Dorset, where it is locally abundant. 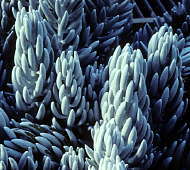 Several other unrelated plants are known as "Samphire" including halophyte succulent species in the Family Amaranthaceae, Salicornia (Marsh Samphire) and in the Family Apiaceae Crithmum maritimum (Rock Samphire). The common name "Samphire" is a corruption of French "Saint Pierre" (Saint Peter), named for the patron saint of fishermen because these edible plants grow on salty rocks along the European coastal margins. 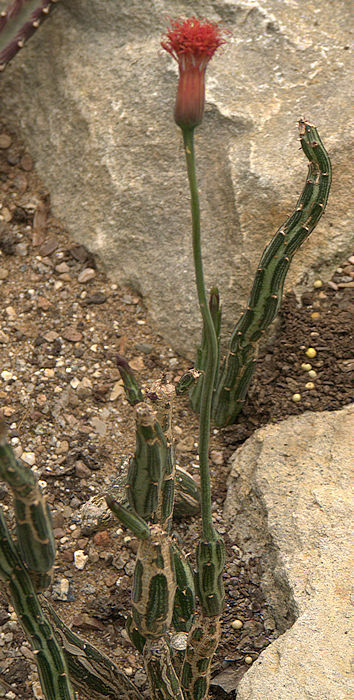 This short-lived perennial has trailing green stems with elongated, pointed green succulent leaves which are more or less fleshy according to the salinity of their environment. The purple flowers surround a disk of bright yellow stamens and are produced in late Summer. Native to coastal margins of Great Britain except for North-East Scotland, and Europe, being especially common in salt marshes and mud flats. The succulent leaves are edible. 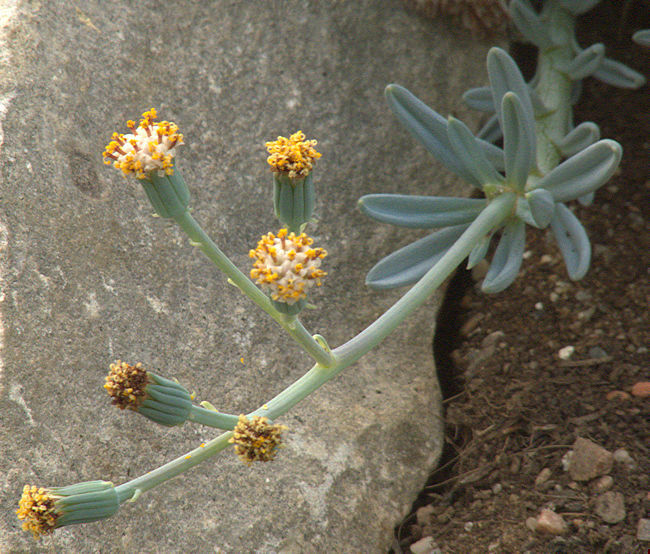 This genus is very closely related to Senecio with small differences, mainly in the bracts surrounding the flower. 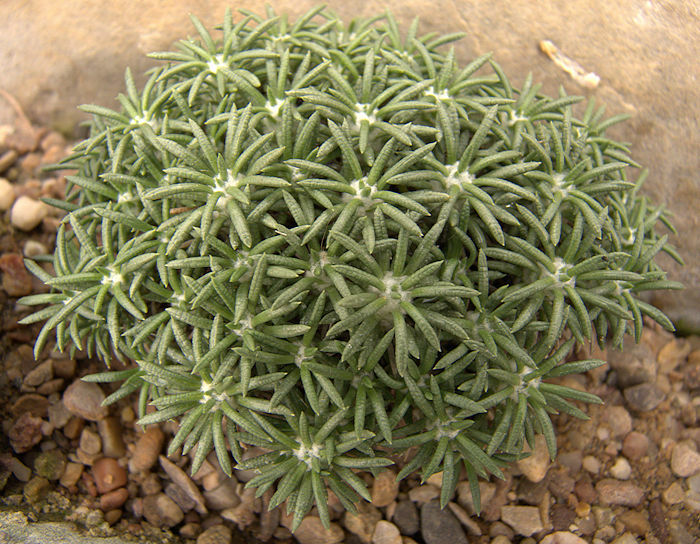 The genus incorporates around 100 species from Southern Africa with diverse lifestyles including pachycauls and caudiciforms, trailing mats with succulent leaves, geophytic tubers with seasonal foliage and small shrubs. 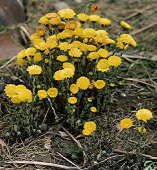 Flowers are generally yellow daisies except for a few purple-flowered species. 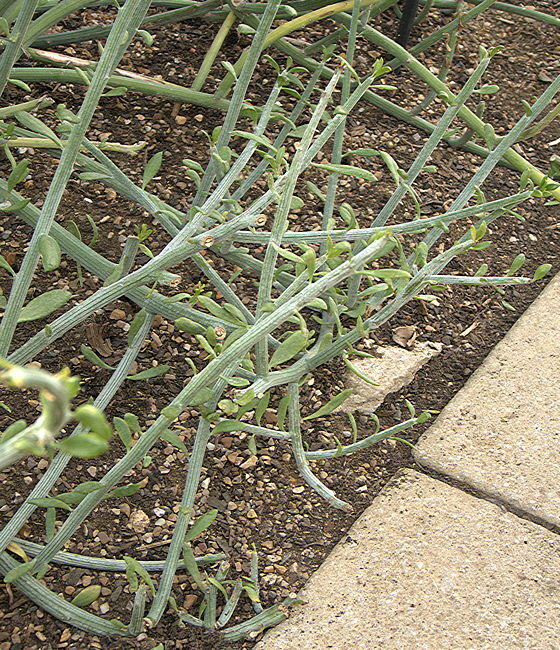 Trailing purplish stems bear elongated, pointed green succulent leaves. The bright yellow flowers have several ray petals surrounding a disk of stamens. Native to the Western Cape of South Africa. Name: Latin loba = lobe, referring to the leaves. This shrubby caudiciform may grow up to 10 in tall. 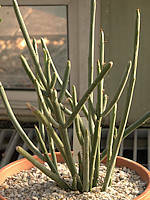 A cylindrical succulent caudex produces thin branches with ovate gray-green leaves. The stems are initially green, becoming brown. The yellow flowers have 5- 6 well-spaced eliptical petals, with a tuft of yellow stamens. Native to the Cape Province of South Africa. 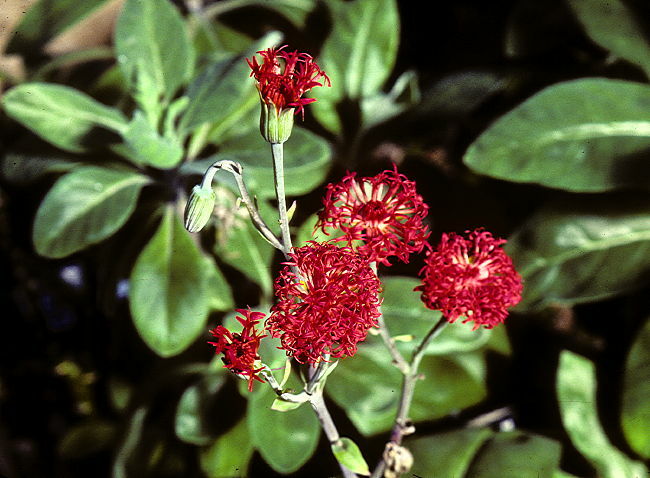 A large genus of around 1500 species that has been variously split into Kleinia and Notonia but is presently united. Many species are non-succulent weedy Ragworts and Groundsels but there are sufficient undemanding succulent plants here to interest the collector. 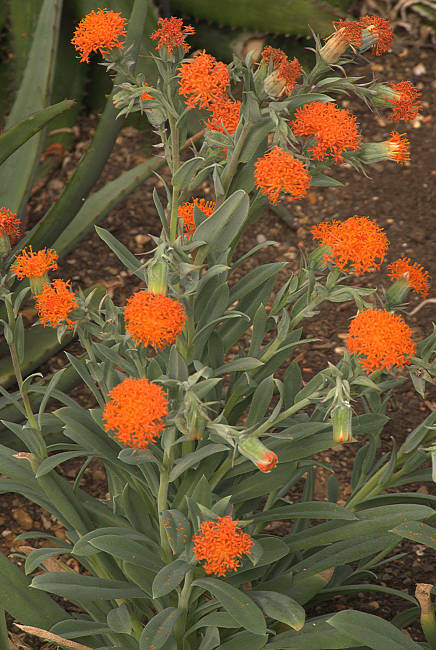 Several species are worth growing for their striking, brightly coloured pom-pom flowers. 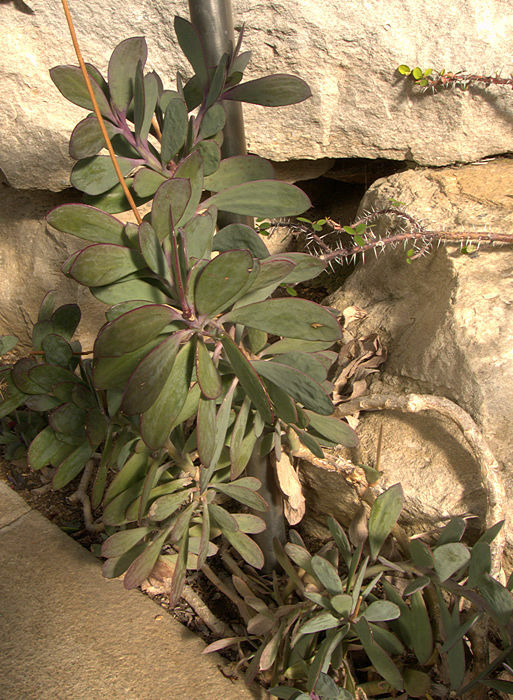 Several Senecios are stem succulents with vestigal leaves. Dendrosenecio battiscombei Syn. 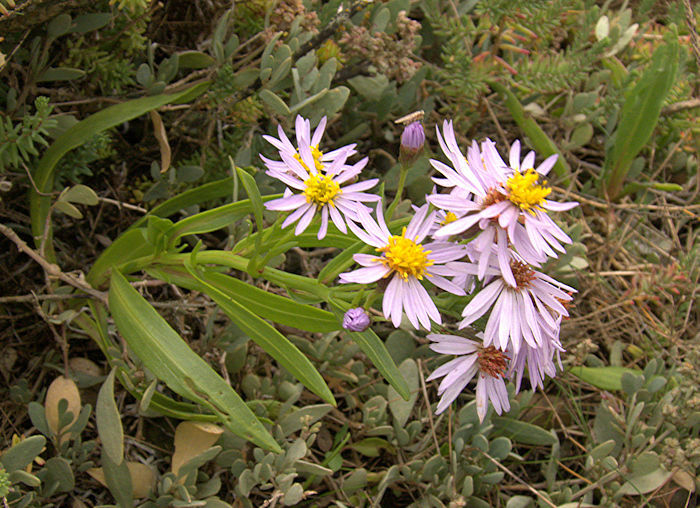 Senecio battiscombei from Mt. Kenya and Mt. Kilimanjaro is noteworthy for growing up to 20 ft tall with large rosettes of leaves supported by stout, woody trunks. 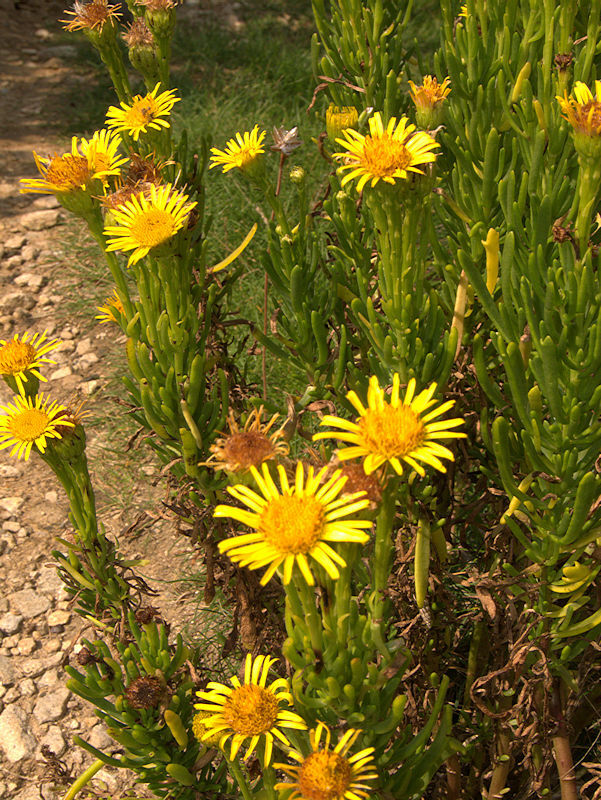 Many species of Senecio contain Pyrrolizidine alkaloids and other toxins, known to cause liver damage and haemorrhaging of livestock. 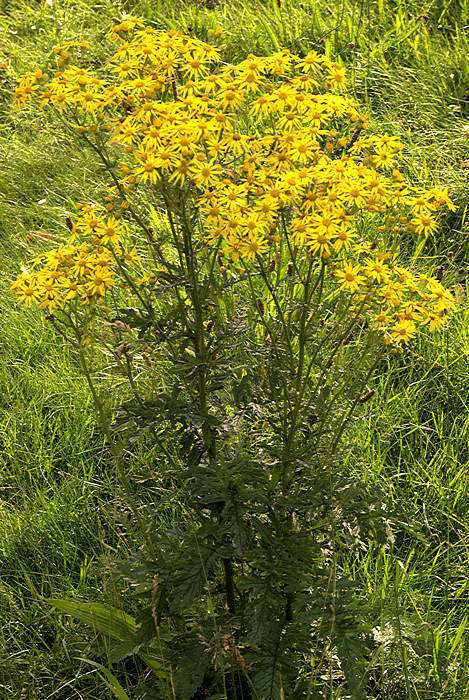 The same alkaloids are incorporated into caterpillars of the Cinnabar moth that use Common Ragwort as food plants and confer a degree of protection against predation. Not only do the caterpillars and butterflies taste distasteful to birds, but subsequent nausea from the alkaloids "trains" the bird to avoid this species. A common cottage-windowsill succulent plant, native to the Cape Province of South Africa. 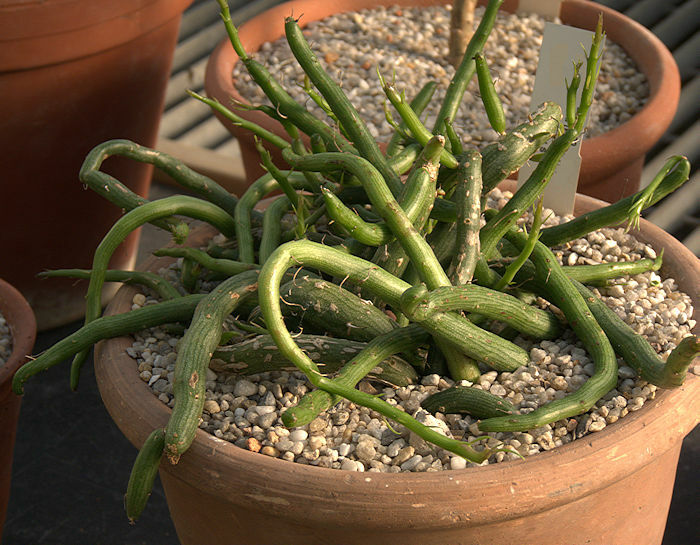 The globose to sausage shaped jointed succulent stems form a disorderly clump. Stems tend to fragment at the joints, but each segment will root and form a new plant. During active growth the stems bear leaves that are notched into arrow shapes along the petiole. The inflorescence is a cluster of small flowers consisting mainly of tufts of curled white petals and brown stamens with curled yellow anthers. 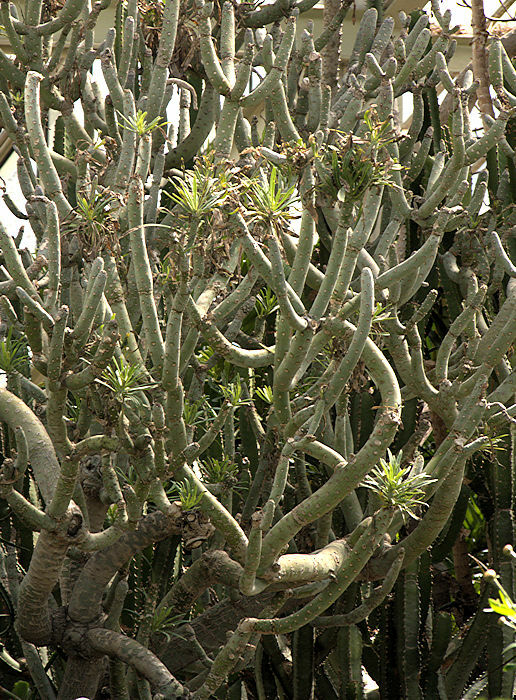 A shrubby plant from South Africa, Zimbabwe and Mozambique with narrow, upward-pointing succulent leaves clustered towards the end of green stems which become brown and woody with age and may extend to 6 ft. The leaves have a groove on their upper face. Old leaves are deciduous and leave a scar on the stem. 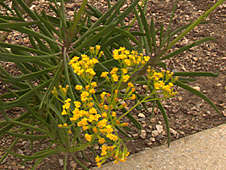 The fragrant golden flowers around the growing point are small tufts of yellow stamens. This species grows at modest elevations and is said to tolerate mild frosts. 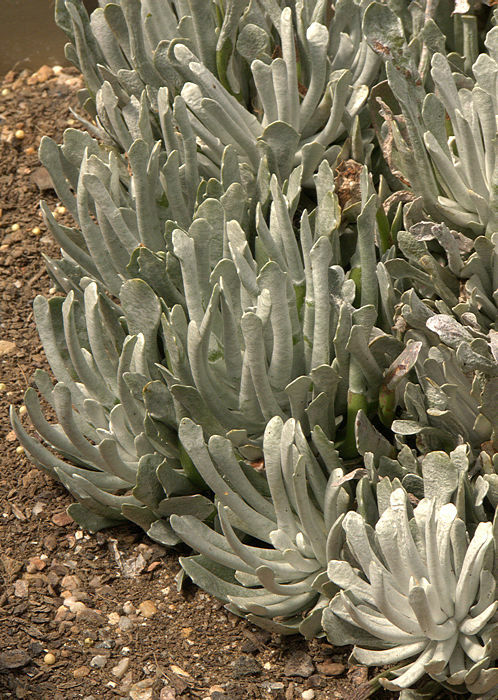 A slow-growing Senecio distributed from Namaqualand to Namibia. 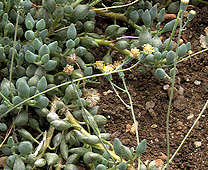 The trailing and branching stems about one sixteenth of an inch in diameter bear single small, lemon-shaped glaucous-blue succulent leaves about a quarter of an inch in diameter on short pedicels. Stems produce adventitious aerial roots that grow down where they make contact with soil. The leaves of some varieties produce a waxy farinose coating that will rub off so these should be watered from below. 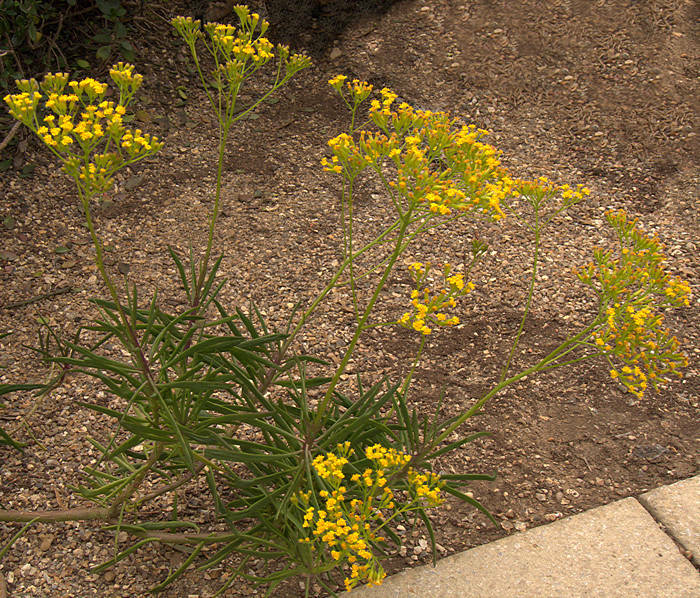 Flowers are white tufts with yellow stamens. 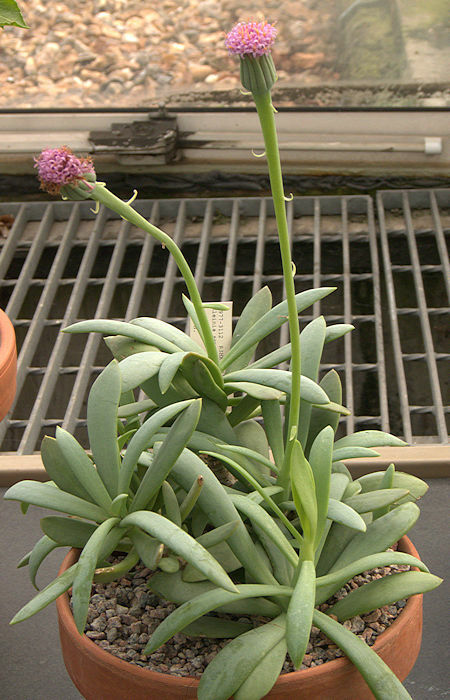 The thick purplish-green ovate succulent leaves are aligned on the purple stem with their flat surfaces vertical, producing a distinctive appearance. Leaf edges are purple. 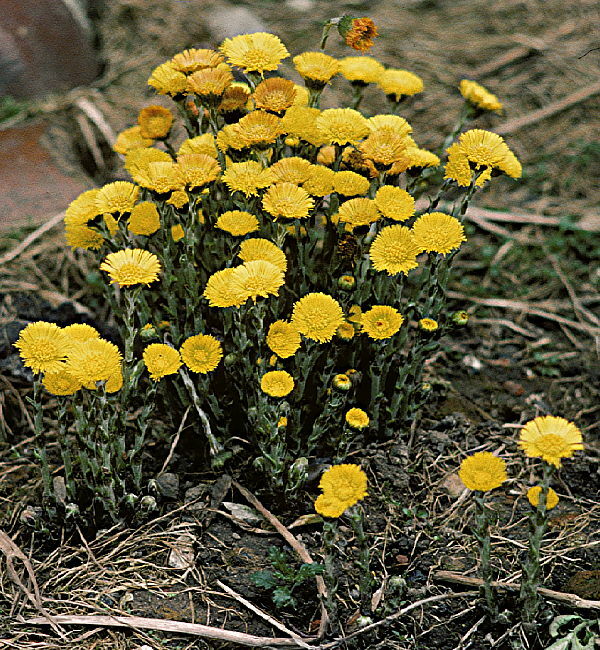 The bright yellow disc flowers have a small number of ray florets. Named for: Albert Deflers (1841 - 1921) Belgium botanist and explorer of Arabia. 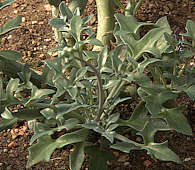 Senecio deflersii is a stem succulent forming sub-shrubs of smooth, thick bright green stems, marked with old leaf scars. The leaves are tiny and ephemeral. 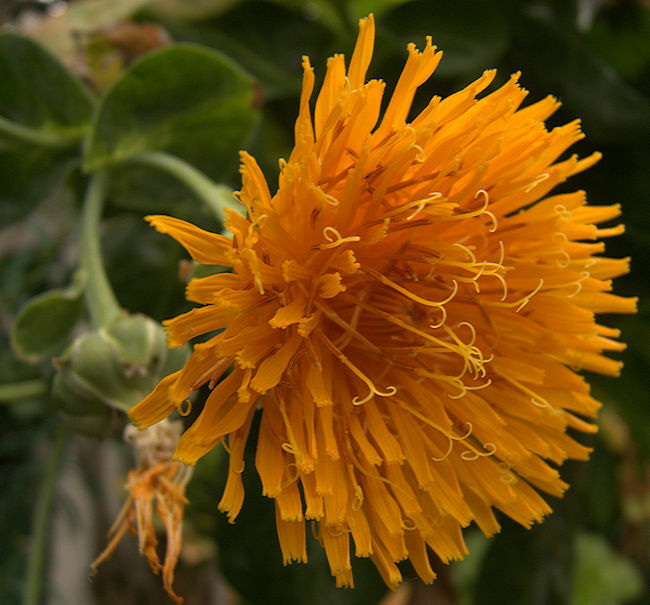 The inflorescence is a bright yellow pom-pom of many florets on a long flower stalk. Native to the Yemen. Not cold-hardy. An upright South-African plant with lanceolate blue-green leaves which continue along the long, branched flowering stem, making a smooth transition to smaller bracts. The flowers are bright orange pom-poms with orange pollen. A classic white plant whose upward-pointing, ovate, succulent blue-green leaves are densely-covered in white farinose wax. The white coating is removed by the slightest touch or even a few drops of water. 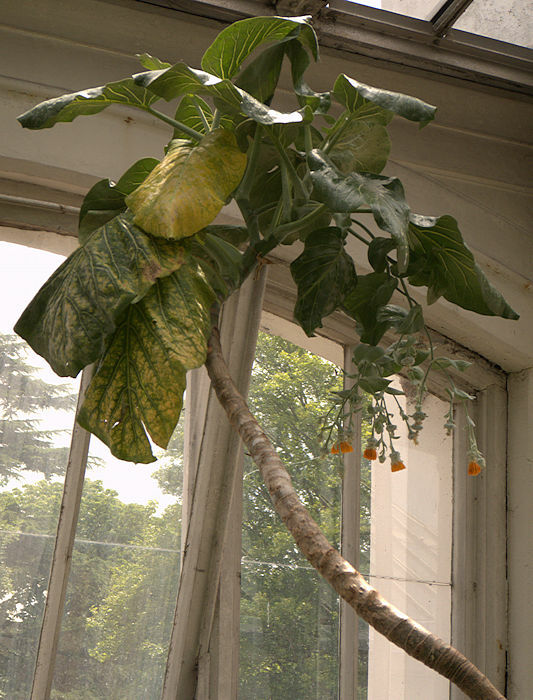 While the plant is easy enough to grow, it is a challenge to grow a perfect unmarked specimen; watering should always be from the base of the pot. Old plants lose leaves around the base. Native to the Northern Cape of South Africa. 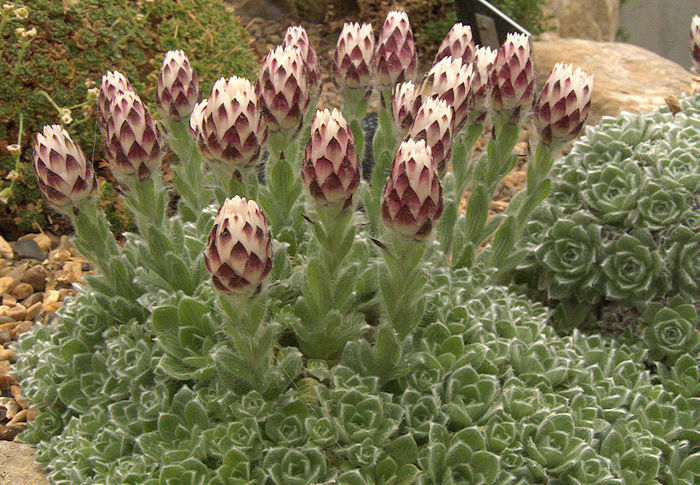 Similar to S. rowleyanus but more robust with stems one eighth of an inch in diameter, bearing globular succulent leaves up to a half-inch in diameter with longitudinal purple-edged windows. Suitable for a hanging pot. 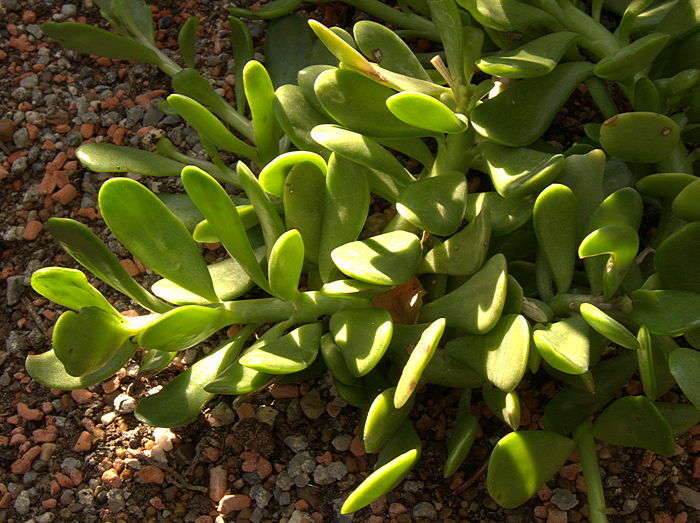 This creeping plant forms a mat of green stems with smooth, obovate, fleshy green succulent leaves. The branched inflorescence carries orange to red flowers with a foetid perfume. 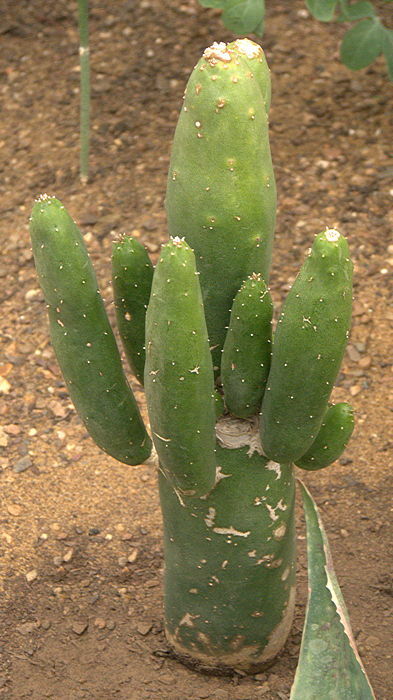 Native to Kenya and Tanzania. 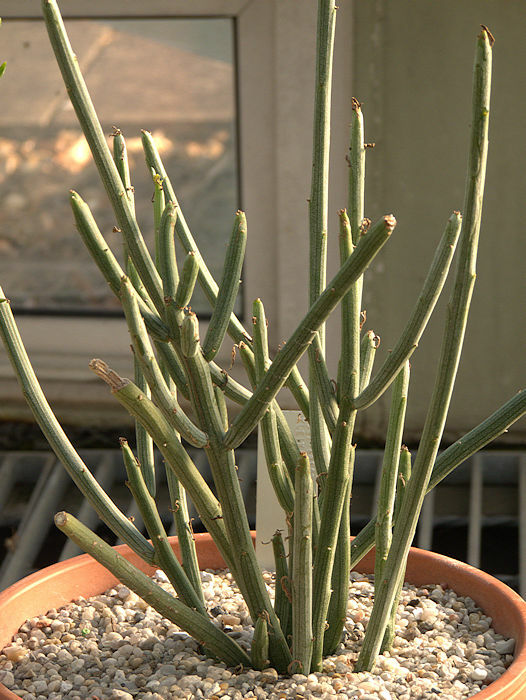 a stem succulent with thin, jointed green stems up to quarter of an inch in diameter. A few vestigal leaves and the flower stems are produced near the growing stem tips. The branched inflorescence bears clusters of bright yellow flowers with four or five ray petals around the central cluster of stamens. Native to the Western Cape and Cape of Good Hope of South Africa. 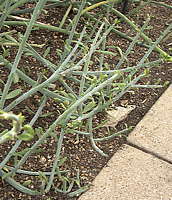 A shrubby stem succulent, growing up to 10ft tall with articulated, fleshy greyish-green branches patterned with leaf scars. 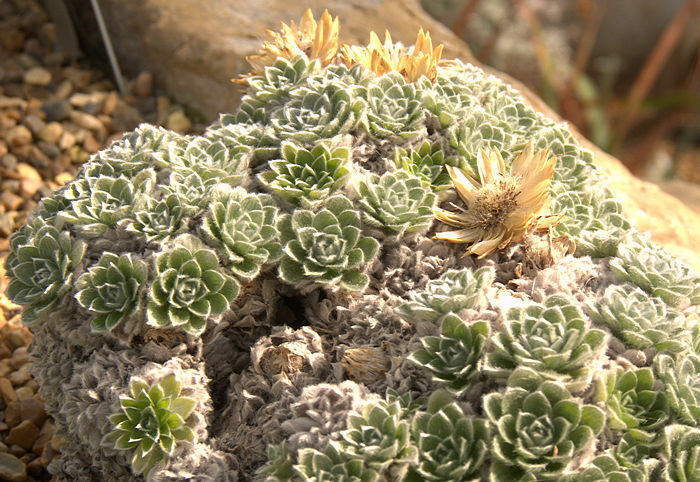 During the growing season, the succulent stems produce ephemeral rosettes of lanceolate leaves at their tips. 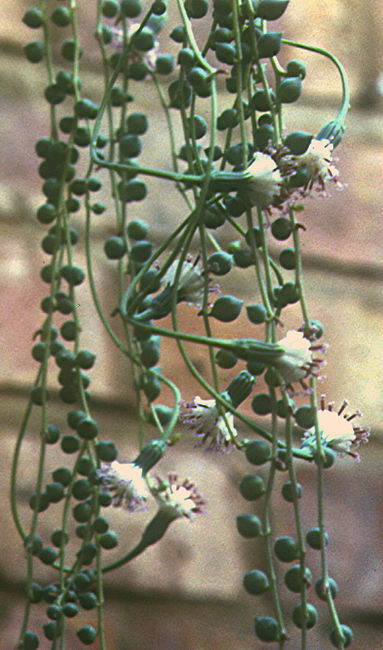 Flowers are yellowish-white and are followed by seeds with tufts of white hairs. Native to all of the Canary Islands, growing up to 3000ft above sea level. 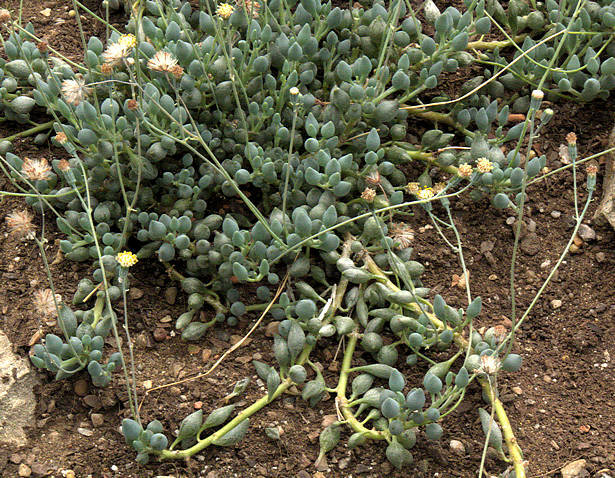 A broader-leaf variant Senecio kleinia fa. 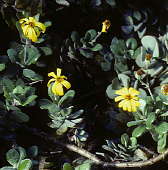 ovalifolia occurs on Lanzarotte and Gomera. 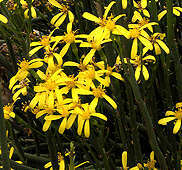 Senecio kleinia is commonly cultivated as a succulent houseplant, requiring full sun to do well. 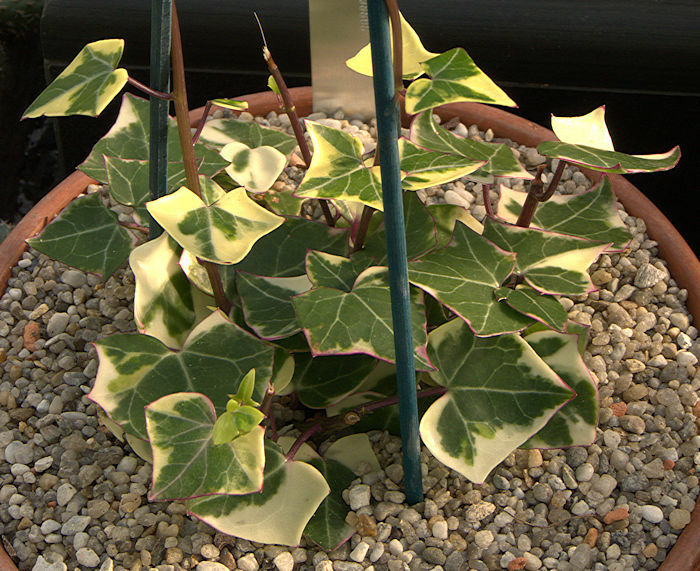 A variegated form is in cultivation S. Kleinia 'Candystick' Rowley 1973. 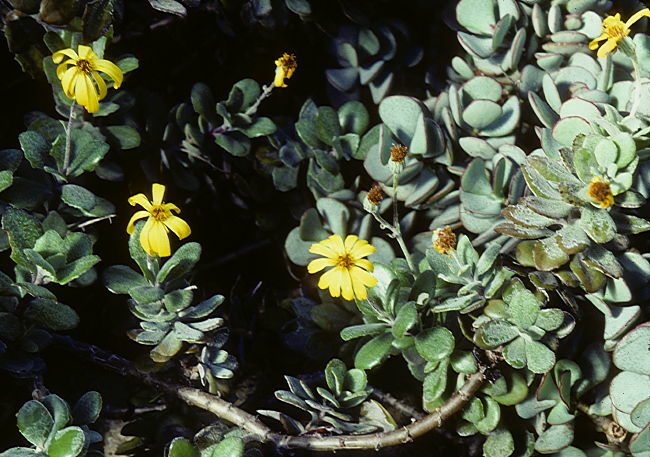 A variable plant with at least three subspecies recognised, widely distributed from tropical Africa, Madagascar and Socotra to the South African Cape. 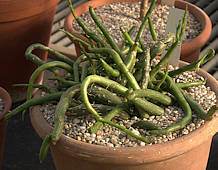 This plant forms a mass of creeping smooth, glaucous green succulent stems, longitudinally striped in darker green to purple and producing ephemeral ovate leaves. 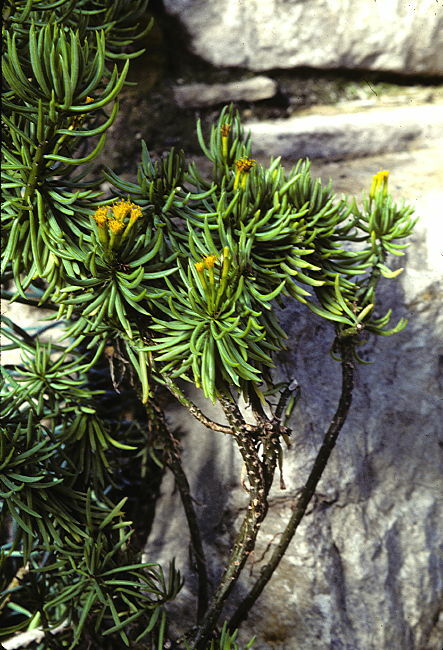 The inflorescence is a tuft of yellow florets. Distinguished by smaller yellow flower head. 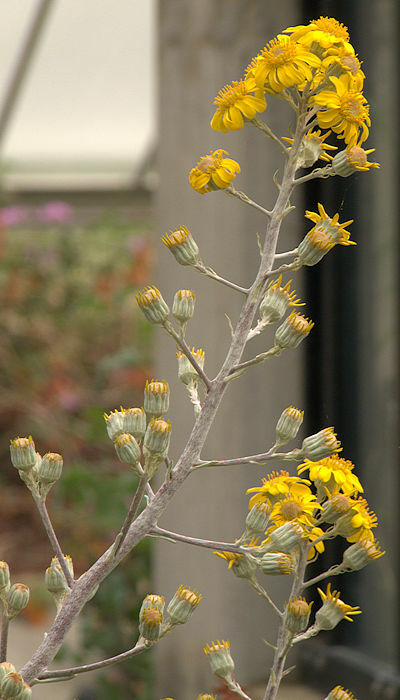 This vining Senecio has ivy-like leaves and pale yellow ray-flowers with 7 - 8 florets. 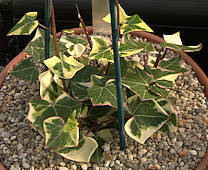 The plant shown is a selected cultivar with variegated leaves, but wild plants more usually have all-green leaves. Native to the Eastern coast of South Africa, Lesotho and KwaZulu-Natal, Zimbabwe and Mozambique. A good subject for a hanging basket or a pot with a small climbing frame. Needs more water than most succulent plants. 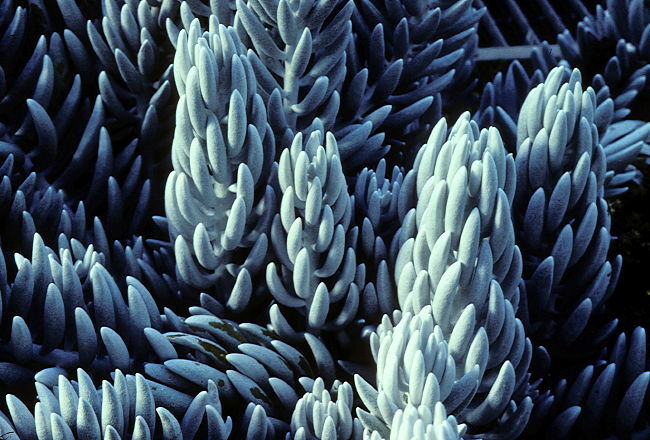 an evergreen shrubby plant whose oval succulent leaves have a farinose coating. Leaf margins may bear a few tiny teeth. Flowering stems bear small numbers of yellow flowers with a marginal ring of petals around the central stamen cluster. 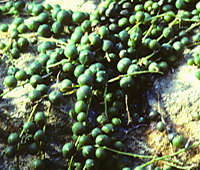 Native to KwaZulu-Natal. an evergreen shrubby plant with fleshy laterally-compressed lanceolate succulent leaves and a thyrse of small yellow flowers. 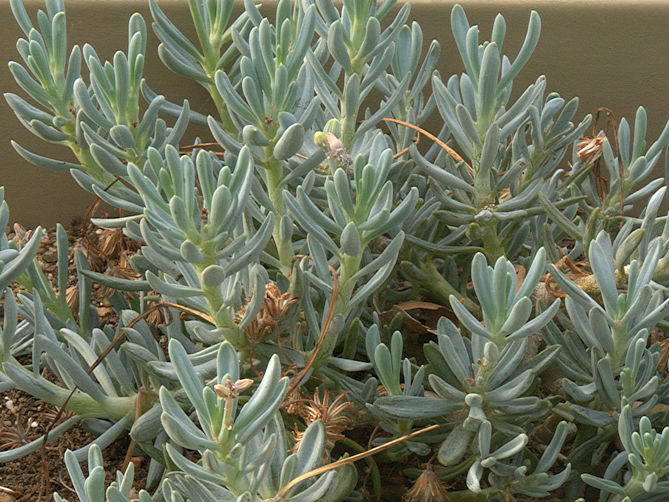 An upright succulent plant with oval blue-green leaves, making this Senecio worth space even when not flowering. The flowers on long, branched stalks are spectacular crimson pom-poms, decorated with bright yellow pollen. Native to a wide range of Central and East tropical Africa from Nigeria to Kenya, Tanzania and Ethiopia. Although the plant is poisonous in large doses, an infusion of the tuberous powdered root is a traditional remedy to promote healing of cuts and sores, for diseases of the eyes and for syphilis. S. nyikensis var hildebrandtii is a more compact plant with orange-red flowers. This plant has prostrate marbled succulent stems that arch over and touch the soil where they root, sending out more stems. Tiny vestigial leaves are produced at the growing point but soon wither although remaining attached. 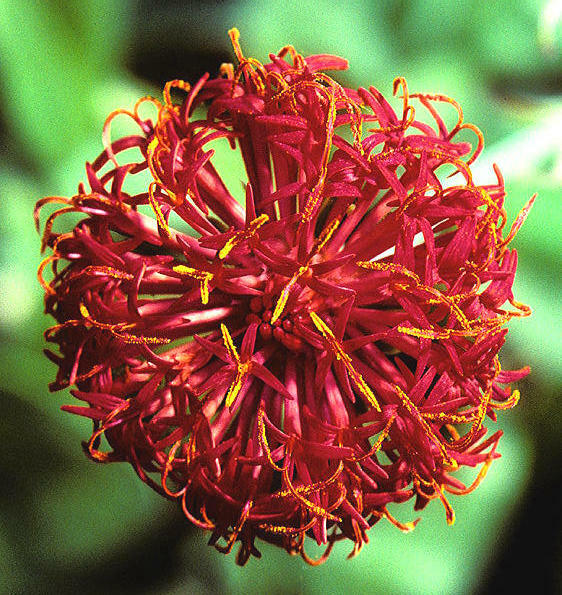 The inflorescence is a showy red pom-pom of many tiny flowers. Native to Eritrea, Ethiopia, Somalia, Kenya and Yemen. This plant has a tendency to crawl out of its pot and needs a shallow planter with a substantial area. This plant forms a shrubby tangle of brittle, frequently-branching pale green cylindrical stems with darker longitudinal striations. Small vestigial oval leaves are produced at the growing points. The inflorescence is a sparse tuft of fawn-coloured filaments, style and stamens. Native to mountains of East Africa, including Kenya, Ethiopia, Djibouti, Somalia and the Arabian peninsula. 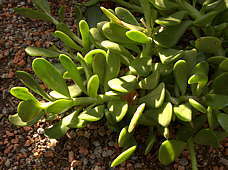 Sub-shrubs with upright, sparsely branched stems carrying long rounded fleshy dark green succulent leaves pointing upwards and arranged more or less randomly along the stem. Stems and leaves ca4ry a fine greyish coating which is easily marked. The branching inflorescence carries many bright yellow disc flowers. Native to the Eastern Cape of South Africa. Senecio radicans Linnaeus fil 1845 - similar to S. rowleyanus but smaller, hook-shaped leaves. Named for: Gordon Rowley, English botanist. An easily-grown Senecio from South Africa where it grows along the ground under scrubby bushes. 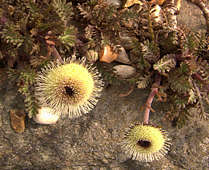 The trailing and branching stems, about one sixteenth of an inch in diameter, bear single small, spherical, bright green succulent leaves about a quarter of an inch in diameter on short pedicels. Each leaf has a narrow clear window from stem to tip. Stems produce adventitious aerial roots that grow down where they make contact with soil. Flowers produced on side shoots in the winter, are white tufts with purple stamens and a spicy perfume. Grows well in a hanging basket. 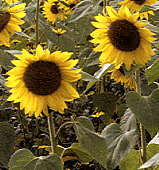 Variegated cultivars are sometimes available. 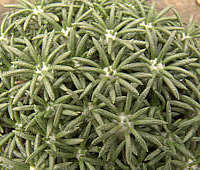 This clump-forming plant has stemless rosettes of spatulate green succulent leaves covered in white farina. 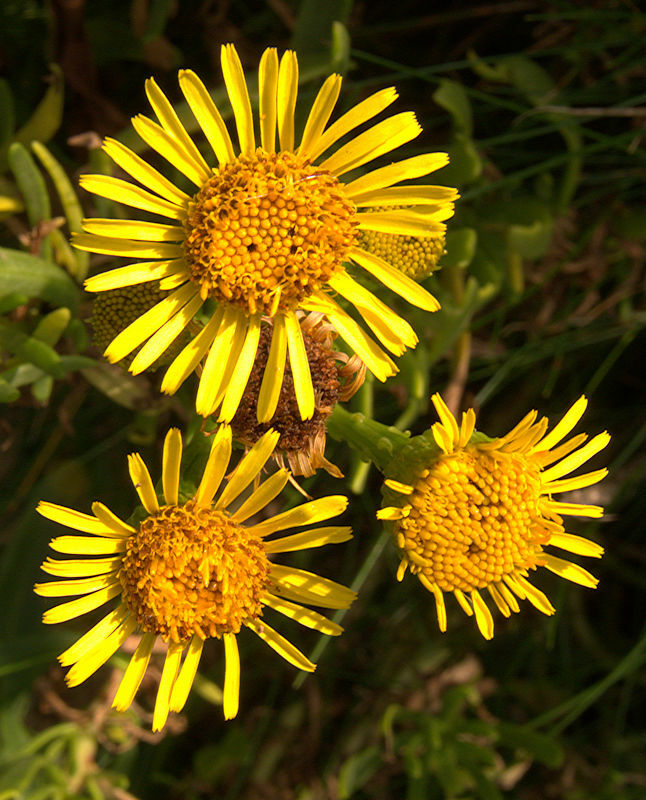 The inflorescence is a small cluster of showy, yellow disc flowers. Native to the South African Cape. In cultivation it should be watered from below to avoid spoiling the white coating on the leaves. 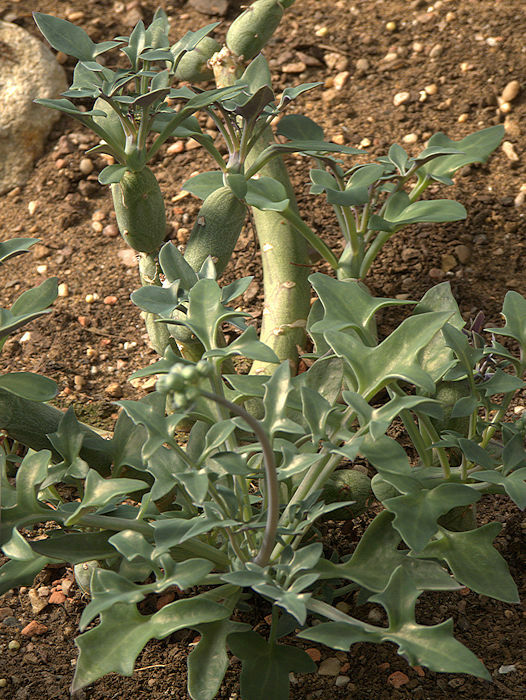 From a knobbly caudex arise stems carrying obovate to lanceolate green succulent leaves covered in white farina. The inflorescence is a small tuft of fragrant pink to purple flowers with orange stamens. Native to Arabia. 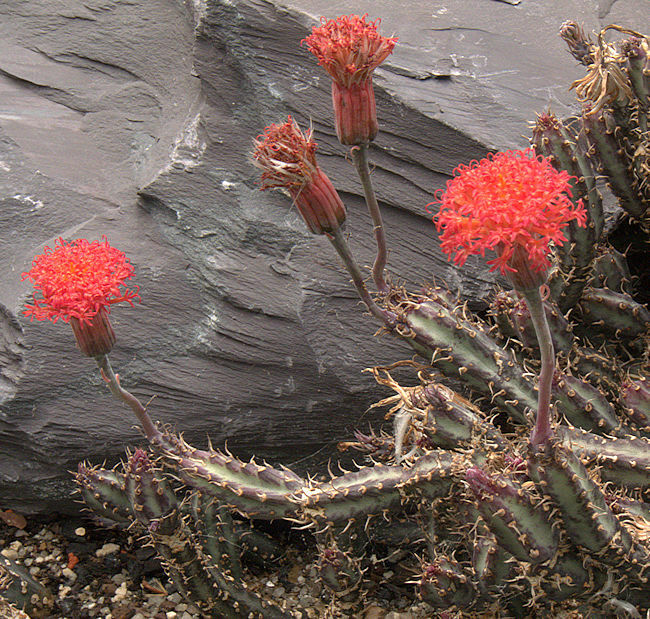 Subspecies grantii is a larger plant from East Africa, with bright red flowers. 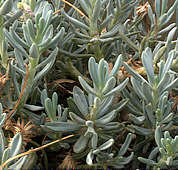 The creeping stems bear elongated oval bluish succulent leaves with a distinct longitudinal groove on their upper surface. 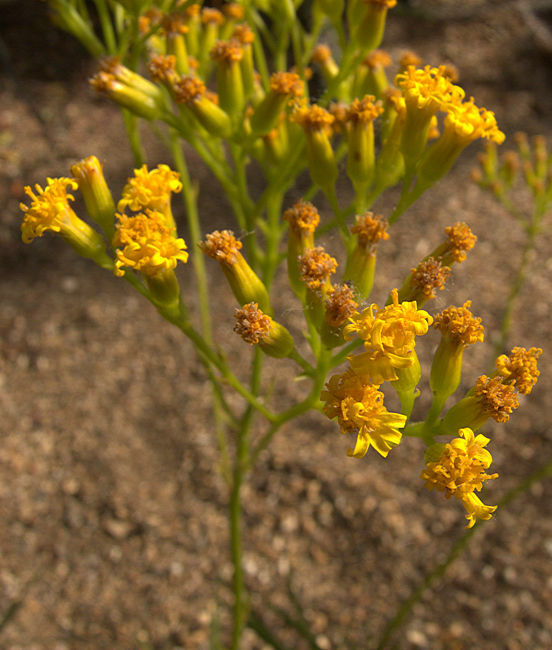 The inflorescence consists of a branching bluish flower stalk with tufts of white flowers offset by exserted yellow stamens. Native to the South African Cape. A cristate form is known. A stem succulent spreading via rhyzomes. The dark green angular stem has purple markings, pronounced and brittle joints where growth has ceased for a while. Vestigal leaves along the stem angles near to the growing point dry out quicly but are retained as scales. 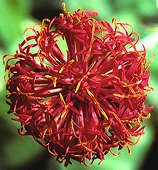 The scarlet pom-poms of many small flowers with yellow stamens are very decorative. Native to Kenya and Tanzania. 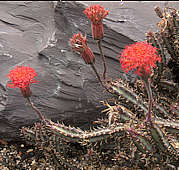 A variety from Kenya and Tanzania with a much smaller flower and few vestigal leaves along the succulent stems. Cristate forms are in cultivation.